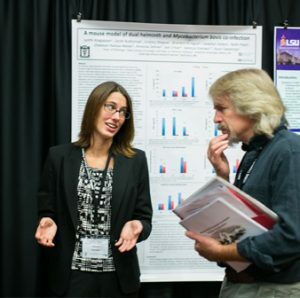 The 29th annual National Veterinary Scholars Symposium drew more than 650 veterinary students from across North America and Europe, animal health researchers, and leaders from more than 36 veterinary schools, to view research accomplishments by veterinary students completing summer research internships. The Boehringer Ingelheim-sponsored program, which allows veterinary schools to introduce first- and second-year veterinary medical students to biomedical research, was held Aug. 4-5 at Texas A&M University. 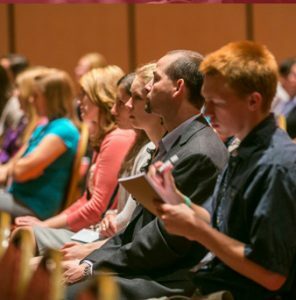 Presentations and panel discussions provided students with perspective on various topics, including global food security and sustainability, emerging and zoonotic infectious diseases, and antimicrobial resistance. At each of the more than three dozen participating institutions, BI Veterinary Scholars are assigned a mentor and a laboratory. Each scholar conducts a hypothesis-driven research project, developed jointly by scholar and mentor, over a 10- to 12-week period during the summer. At the program’s end, scholars present their findings to their peers and attending faculty. As part of the Veterinary Scholar Program, each year Boehringer Ingelheim presents awards to one graduate student and one undergraduate student for exemplary research projects. Andrew Lewin, DVM, comparative ophthalmology resident at the University of Wisconsin School of Veterinary Medicine, received the 2018 Boehringer Ingelheim Veterinary Graduate Award. As part of his research into infectious ocular disease and glaucoma in several animal species, Dr. Lewin established a nationwide network of cat shelters to provide quantitative clinical scores and eye swabs for cats with ocular and respiratory infections to determine the epidemiology of these pathogens nationwide. He also obtained viral isolates for genomic sequencing and phylogenetic analysis, making other downstream analyses possible with these samples and the data set. Kathryn C. Taggart, an undergraduate student at the University of Florida College of Veterinary Medicine, received the 2018 Boehringer Ingelheim Veterinary Research Scholar Award for her study of dilated cardiomyopathy in Doberman pinschers, which is difficult to recognize and response to treatment has not changed drastically in 30 years.